When it comes to salad dressing, I’m on auto-pilot. It takes me mere seconds to whip up an oil-free vinaigrette and it’s really light and wonderful – but – it’s getting a bit tired. Enter the ripe tomatoes Kel has been bringing in from the garden. In went some olives and miso because everything tastes better with them. The dates temper the tangy acid and the vegetable broth lends richness. 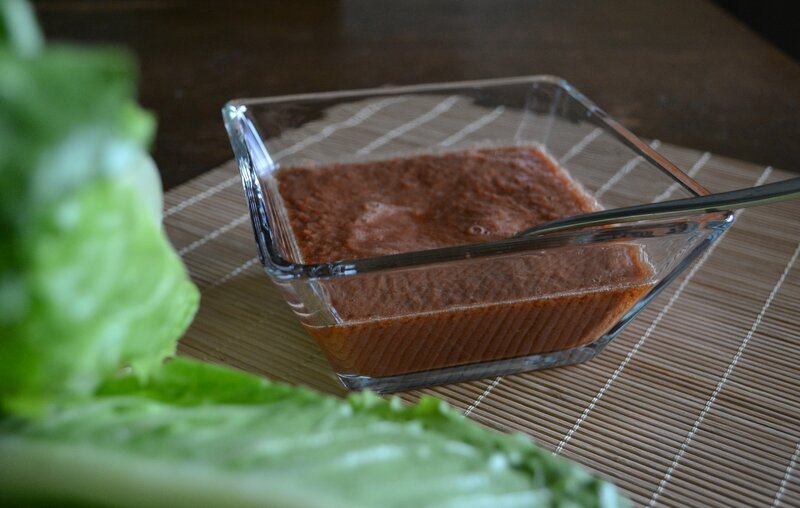 Takes almost as much time to make this oil-free miso salad dressing as it does my old standby. Vary this by using fresh herbs instead of dry or a different vinegar. A great way to use homegrown tomatoes coming in from the garden, this oil-free dressing elevates even the simplest bowl of fresh greens. Looks like a great idea for the summer. Lovely photos! That sounds like it would be fantastic with fresh basil. Or dill. Or cilantro. Okay, just about any fresh herb–yum! Totally! Next time I need to use fresh herbs for sure! gorgeous dressing, Ann! I need to get my salad on and you’ve inspired me! Nice to inspire each other, isn’t it?! Oh, I’m so thrilled to hear that! I love the idea of using it with roasted veggies – yum! mmmmm, I’m loving the sound of the tangy ingredients with the herbs and love the idea of using it on a roast veg salad as well. That looks like it might be a nice soup! I like the idea of it hot with the roasted veggies Nicole suggested. I’d love to see some photos of Kel’s tomatoes, too, I love vine tomatoes and wish I grew them myself. You’re right, Lorna. With a few tweaks, it would make a really yummy soup. Hmmmmm…. I just made this stunning & tasty dressing! I had some salad left over from dinner yesterday & had to make it! But I used white miso because that was what i had in the fridge. Sophie! That is so cool! So glad you loved it! All the more reason to whip out the blender!! I need a good vegan salad dressing, marking this for the future! I know, right – I’m all about blending these days ;-). He’s worse than a teenager!! He ate a whole fresh loaf of whole wheat sandwich bread today. Dying. Totally! This does sound perfect…. All my favorite ingredients – delicious! A must try! I’m alot worse, at least your go-to dressing is homemade, mine is store bought. I shall make the transition though. Thanks for this recipe… I LOVE kalamata olives! Looks so lovely, Annie! I needed some salad dressing re-inspiration. I need some re-inspiration for meals in general these days ;-)! What is it about miso that just elevates something from tasty to pure genius? I love adding it to dishes, I must try this! Literally JUST finished a huge salad with this on it… thanks, this got me out of a salad dressing rut! Love the olives and tomatoes, they are original!